At the 2014 National Elections in Kosovo, the disability community was widely engaged in election observation for the first time, with 230 persons with disabilities deployed for the Disability Access Monitoring Mission. This observation mission was a part of IFES Kosovo’s USAID-funded project “Increasing Inclusion and Mitigating Violence in Electoral Processes”, and was implemented by IFES’s local partner, Kosovo Democratic Institute (KDI) in conjunction with a disabled persons’ organization (DPO) HandiKOS. The opportunity to observe elections was an empowering experience for persons with disabilities who participated and who now felt included in the electoral process. However, for most of the estimated 200,000 persons with a disability in Kosovo the numerous barriers to their daily lives, such as the lack of quality healthcare, poor access to education and employment, lack of accessible infrastructure and information, and issues with social integration, are the higher priority issues. With the Kosovo media providing rare opportunities for raising disability issues, DPOs barely have their voices heard, and when they do, the focus has been on issues affecting daily lives, rather than the equally important rights to participate in all community decision-making. 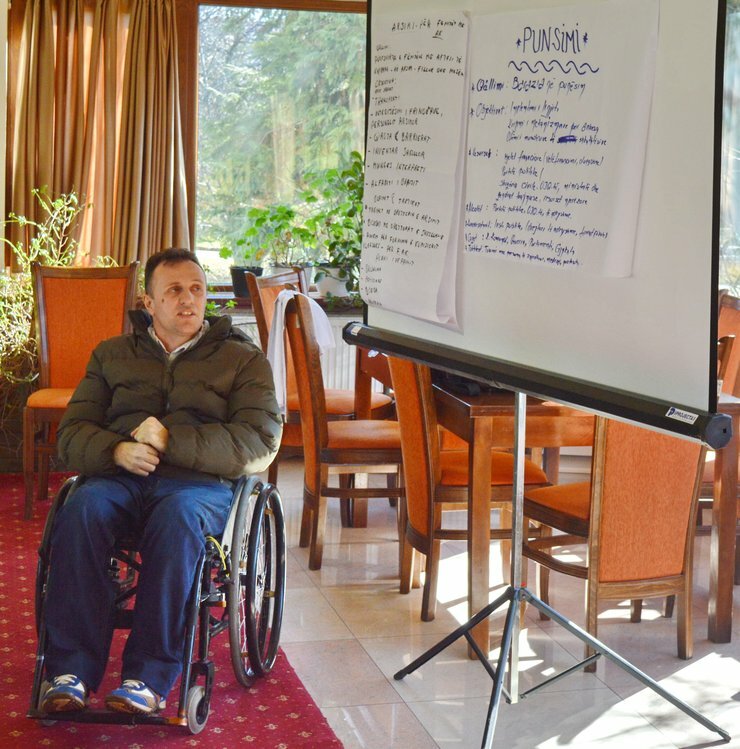 To empower members of DPOs to raise their voices, KDI held six advocacy training workshops with persons with disabilities in six regional locations in Kosovo. These were attended by representatives of local DPOs from communities of persons with physical, visual, hearing and intellectual disabilities. The goal of the training was to equip the participants with advocacy tools and the skills to use mass media to raise the range of issues important to the disability community. Through a one-day interactive program, a total of 150 participants learned about and practiced developing an advocacy strategy, organizing a press conference, and preparing a press release. With these skills, persons with disabilities will be able to influence the media to give a higher profile to disability issues, and to pressure public institutions into giving higher priority to their issues of concern. Currently, according to a representative of Down Syndrome Kosovo, any disability related news is the last to be considered for broadcast in local news programs. With the skills acquired in these trainings, DPOs will be working to change that. In addition to these advocacy trainings, the Election Access Working Group (EAWG), a multi-stakeholder group supported by IFES, engaged a media specialist to develop a handbook on how media can be used as an advocacy tool by disability communities. The EAWG is distributing this handbook to all DPOs in Kosovo. It provides advice to DPOs on issues such as how to develop and maintain relationships with journalists and how to structure their organizations to facilitate strong media relations. The handbook provides practical tips for getting disability related news published or broadcast in mass media. The combination of the advocacy trainings and media handbook will strengthen Kosovo disability communities’ capacities to ensure that the public and policy-makers are aware of the issues they face, so that inclusion of persons with disabilities becomes a higher priority issue for Kosovo institutions. Alan Wall, International Foundation for Electoral Systems (IFES) Chief of Party in Kosovo since September 2013, has 30 years of experience in electoral administration and as a democracy adviser. Mr. Wall has published widely on electoral issues, including as co-author of International IDEA’s Handbook of Election Management Design and a lead author for the ACE Project’s Electoral Encyclopedia in the fields of electoral management and voting operations. Brikena Avdyli has been the Project Officer for Inclusiveness at IFES Kosovo since September 2014. Before that, she worked with local civil society organizations managing capacity building projects for persons with disabilities and youth. She holds a master’s degree in International Development from American University in Washington D.C.